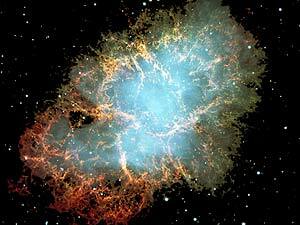 The Crab Nebula is a huge mass of blue haze and twisted clumps of red gas located about 6,500 light years from Earth. It is a gigantic explosion cloud--the tortured remains of a supernova explosion first seen in 1054 A.D., almost a thousand years ago. Even though the explosion started a long time ago, the cloud is still expanding. The reddish clumps are moving outward with speeds near 2,000 kilometers per second--about 4 million miles per hour. The cloud, now about 10 light years from end to end, has engulfed many star systems. If life existed on planets in any of those star systems, it would now be struggling to survive. The cloud thins as it expands and is so far away that it poses no threat to Earth. Image courtesy of the European Southern Observatory. In this alternate explanation of the dinosaurs' disappearance, a huge star close to the solar system exploded, showering Earth with intense light and high-energy particles. Such explosions, called supernovae, are triggered in different ways. Most supernovae result from the explosion of very large and bright stars or the binary companions of bright stars. If a supernova caused the extinction of the dinosaurs, the pre-explosion star would had to have been close to Earth and very bright in the night sky like the "Dinostar" of our story. Every supernova releases enormous amounts of electromagnetic radiation, or light, including X-Rays and Gamma rays. Nuclear reactions like those in man-made nuclear explosions occur in supernovae, making huge amounts of radioactive matter. The radioactive matter is thrown out into space by the supernova blast. As the light and matter from the explosion expand outward, they become less concentrated and less deadly. But for any life forms within about fifty light years of a supernova, the effects would be devastating.